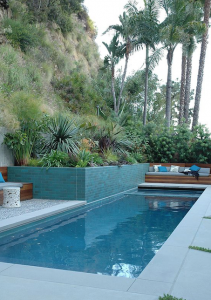 A Creative Swimming Pool Design is a welcome improvement to any garden. 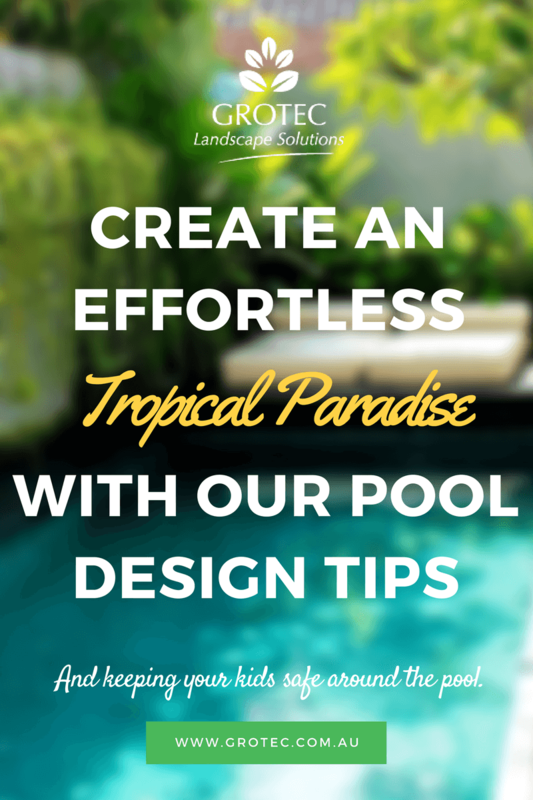 Create a resort style, tropical theme and turn your swimming pool into an oasis. Landscaping around the swimming pool will also create add a luxurious feel. There are a number of regulations for pool fencing that are required by Queensland law, you can find information on this here or you can consult with the Grotec team to ensure you have correct child resistant barriers when considering your swimming pool design. Pools will vary in size, shape, and construction material, only limited by land contours, and the costs – additions of fountains or waterfalls as well as lighting and accessories will clearly increase these. Adequate shade is a must to prevent the damaging effects of sunburn. When choosing accessories as part of your swimming pool design, the plants should be flowers or fruit with minimum drop of leaves, and will be tolerant of extra sunlight reflected from the pool. Seating will depend on space available, either inside or outside fencing. Get that holiday resort feel at home with Grotec’s creative swimming pool design and landscaping assistance. Plants give exterior ambience when they are part of pool landscaping, and could include banana (Musa sp. ), Bird of Paradise (Strelitzia reginae), Lily of the Nile (Agapanthus orientalis), Canna (Canna indica) or Wild iris (Dietes bicolour). There may also be space to include large pots, with suitable broad leaved or flowering plants that can be changed as the plant ages – in the shaded areas you could include plantings of Azalea (Rhododendron indica), Cast-iron plant (Aspidistra elatior), Kangaroo paw (Anigozanthos sp.) or Banyan (Ficus benjamina), and many others. Poolside furniture comes in a variety of sizes, shapes and costs. Selection will depend on the amount of space available, and, importantly, accessories such as the barbeque, pot plants, toys, and seats must not be within a climbable zone. Grotec experts will landscape and design your swimming pool to look just like a resort!